While covariance measures how two variables change together, it does not tell us the strength of the relationship. Correlation, on the other hand, standardizes how two variables change with respect to one another and measures the strength and direction of the relationship between the two variables. The correlation coefficient r ranges from -1 to 1, which are perfectly negative and perfectly positive correlations respectively. The syntax is based on the formula above. Determine whether a linear relationship exists between X and Y. Calculate the correlation coefficient, r, and interpret its value. 1) Enter each data set as a matrix. 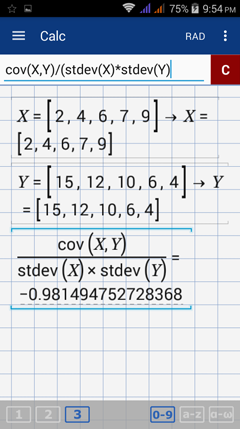 2) If the data set represents a sample, use the command: cov (X, Y) / (stdev (X) * stdev (Y). If the data set represents a population, use the command: covp (X, Y) / (stdevp (X) * stdevp (Y). The negative value of r implies an inverse relationship between X and Y. That is, as X increases, Y decreases. Since r is very close to -1, the relationship between X and Y is strongly negative. Although you can find the correlation through the cov, stdev and stdevp functions, you can take a shortcut by using corr. To use this function, hold the factorial (n!) and select corr or corrp. "corr" is used to find the correlation coefficient of a sample while "corrp" is used for a population. 2) Hold the factorial (n!) key and select corr if the data set represents a sample or corrp if it is a population. 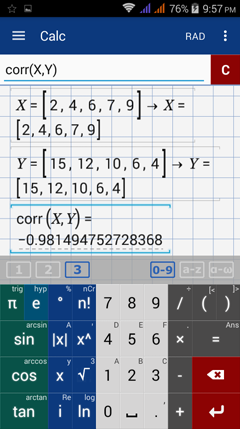 3) Enter the matrices in this order: corr (X, Y) or corrp (X, Y). Using the same data set, find the correlation using the corr or corrp functions depending on which is appropriate. Interpret the value of r.